In one of the more bizarre speeches that Republican presidential candidate Donald Trump has delivered this campaign season, Trump went on a rant that lasted more than ten minutes on new frontrunner, retired neurosurgeon Dr. Ben Carson. Here in Fort Dodge, Iowa, he accused Carson of being a liar and once again, as he did earlier in the day on CNN, likened Carson to a child molester with a pathological disease. "There's no cure for that," Trump said. He had told CNN's Erin Burnett earlier, "I know it's in the book -- that he has a pathological temper or temperament. That's a big problem because you don't cure that. That's like, you know, I could say they say -- as an example, child molester, you don't cure these people. You don't cure a child molester. There's no cure for it. Pathological, there's no cure for that." At one point, Trump stepped away from the podium and displayed his belt buckle to the audience to try to disprove Carson's story that he tried to stab someone but was stopped by a belt buckle. He even challenged the audience to try to stab him. "Somebody hits you in the belt, the knife is going in because the belt moves this way," Trump said. "It moves this way. It moves that way. He hit the belt buckle. You want to try it on me? Believe me it ain't going to work. You're going to be successful." It should be noted that this was the first public event for Trump in which Secret Service provided him with protection. So, metal detectors set up to screen attendees for sharp objects probably made it a little less likely that anyone would take Trump up on the dare. Then came the kicker. "How stupid are the people of Iowa?" Trump said, referring to Carson's newly found high standing in the state. "How stupid are the people of the country to believe this crap?" There were other strange moments from the speech. Near the beginning of the speech, Trump referred to Florida Sen. Marco Rubio as a "lightweight," only to say later in the speech that it's a derogatory term and that he refused to call him that. Trump also said at the beginning of the speech that he would take questions from the audience. His Iowa co-chair Tana Goertz roamed the audience with a microphone ready to hand to an audience member. Except, Trump spoke for nearly an hour and a half and then proceeded to walk off the stage, seemingly forgetting about the questions he'd said he'd answer. Nobody was safe from attacks. He went after Democratic frontrunner Hillary Clinton, claiming that she had no qualifications for the presidency beyond the fact that she's a woman. 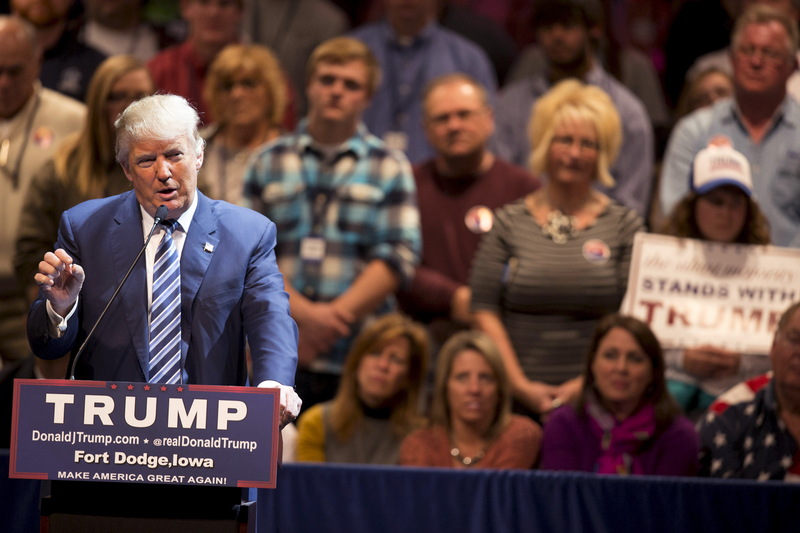 The crowd of roughly 1,400 at Iowa Central Community College was subdued throughout the speech, although this was partially due to the venue, an indoor auditorium where everyone was seated, a rarity for a Trump event. At one point, Trump went after President Barack Obama's handling of the operation to kill Osama Bin Laden, saying that it wasn't a hard decision. "So we have a choice, we can either leave em alone, Mr. President, or we can go and either take him or bomb the hell out of him," Trump said. "Who is going to say leave him alone? Is there anybody that would have said that?" Trump also said he knew more about ISIS than generals do, and he also revealed his plan to fight ISIS - sort of. "People are thinking like I don't have a plan," Trump said. Then came the plan, in case the audience doubted he had one. "I would bomb the sh*t out of them," Trump said, to applause. "I would just bomb those suckers. And that's right, I'd blow up the pipes. I'd blow up the refineries. I'd blow up every single inch. There would be nothing left, and you know what, you'll get Exxon to come in there, and in two months, you ever see these guys how good they are, the great oil companies? They'll rebuild that sucker brand new. It will be beautiful, and I'll take the oil. And I said I'll take the oil." It was unclear whether the speech would have any effect on Trump's standing as a contender for the Republican nomination. Some in the audience approved of Trump's attacks on Carson, like Fready Frank, a 62-year-old freelance electrical engineer from Mason City. "He's dealing with public information that's in the mainstream, in the media, in the discussion, in the debate, on the table," Frank said. "Carson put that information on that table. Trump didn't go and take it out of a garbage can and put it on the table. That's the fair essence of what dialogue is supposed to be for evaluating people to serve the public." Another Iowa native, 57-year-old Wayne Clegg, a businessman who specializes in lead and asbestos abatement agreed. ""I think he's right about Ben," Clegg said. "He's low energy. He has some problems. He's low energy and he's not the guy to have in there." Rick Sandquist, the athletic director at the college where the speech was event, thought Trump's speech was "impressive" but didn't like the Carson attack. "I don't like the negative campaigning, you know?" Sandquist said. "I guess I haven't dug into Ben Carson much. I kind of like to say your positives. That's the kind of approach that I like."